No “Find of the week” this week. I was busy busy every day and wasn’t in the stores and shops much. BUT I did zip over to the Ornamentea parking lot this afternoon to visit the Designer’s Downtown Market and pick up some soap from the fabulous TJ Pappas of Soft Wind Soap. He makes a Tea Tree Complexion bar that is such a wonderful product. I have super sensitive skin and have never been able to use soap on my face until I stumbled upon TJ’s soaps. I also buy his oatmeal bars for Grandboys bath. These are real soaps, not detergents, which is what the soap you buy in the grocery store is. Very, very nice. And not an indulgence at all as they’re reasonably priced, last a LONG time and have eliminated the need for me to use prescription products from my dermatologist. While at the Market, I also stopped by the booth of Tom Kumpf of Double T Farm. I was drawn in by the sight of his beautiful little bunches of beets. 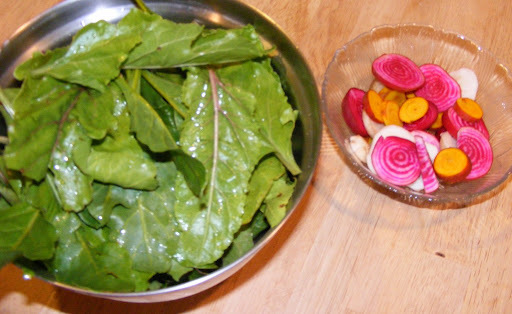 Red and white striped, white and golden beets, all with their delicious greens attached. They were the star of my dinner tonight! Two little bunches netted this bowl of sliced beets and the bigger bowl of greens. I sauteed them all in butter and they were so good. 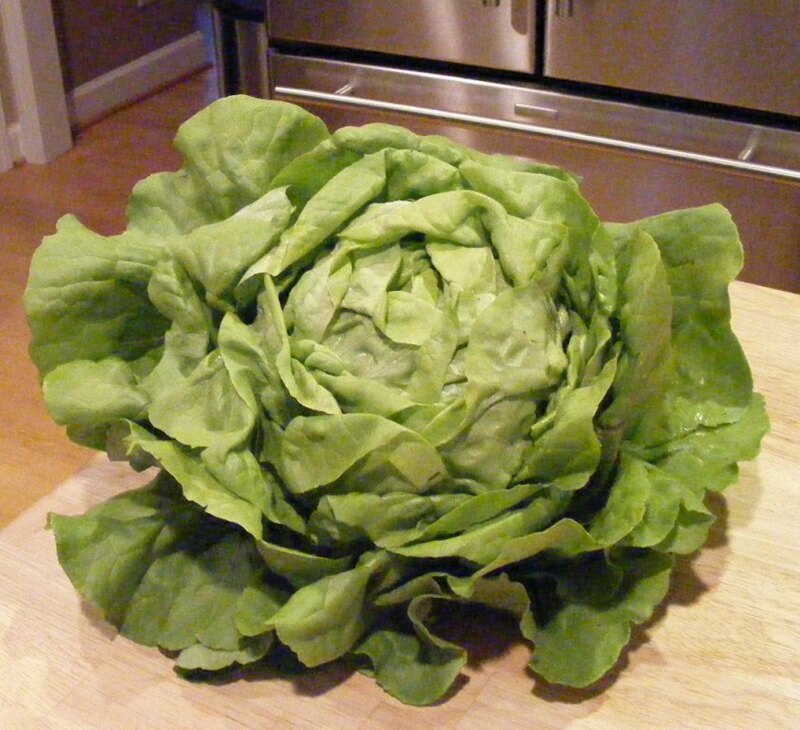 Tom also has the prettiest heads of butter lettuce I’ve ever seen, so I bought one of those as well. Gently washed and dried, then torn up and tossed with olive oil, balsamic vinegar, salt and pepper. I’m drooling as I type (I know, TMI). Tom’s farm does a CSA program, so go to his website and read about it. Fresh, local produce is super delicious! Also on the menu this evening was a pork tenderloin with applesauce and rice pilaf. A Fall feast! I’m a happy girl.